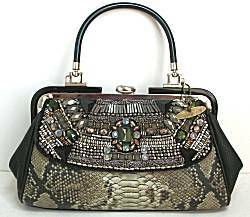 Mary Frances Shaffer of the California Bay-area designs handbags and accessories to suit most any style. Exotic components, unique fabrics, stones, beads and trimmings richly ornament her handbags and belts. Various processes are employed in construction, and the end result always has a "one-of-a-kind" flavor. In fact, all bags are limited editions, limited by component availability and new designs introduced many times per year! Not sure how big the bag is? Try comparing our measurements against another bag you already own! Little bag has a bit of reinforced structure to it, but the graceful folds of floral printed chiffon cover this softly. Bag has 6-1/2 x 2-1/2 inch teal blue leather flat base, 5 inches tall to the blackened chrome frame and clasp closure. The outer fabric has charcoal background with vibrant fuchsia, teal and lavender print. 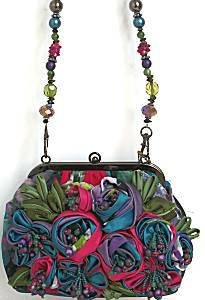 On the front are the satin fabric buds and flowers in the same colors, leafy green too, beads thrusting out from the centers. Interior lined in fuchsia satin with small open pocket. 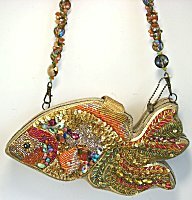 29 inch beaded strap is detachable, you can wear it as a necklace and hold the bag as a clutch! Read about what others think of Mary Frances! Instead of reviews for a specific product, this is a place to share about the designer line in general.